Consistent grain weight 1 grain across a tin of 500 pellets. Very well made with very rare skirt deformations. Excellent for both field target or hunting use. I gave some of these in .177 to a friend to try and now he wont use anything else. The same top quality light weight alternative to Diablo. I purchased 500 of these falcon pellets, after reading mixed reviews. I&nbsp;use them in .177 with my hw100, I cannot fault these pellets, in Quality and accuracy, I used them on range in calm conditions, Shall try them soon in the field. Well worth a try with Air Arms ProSport .177. Weight consistency could improve a little but overall very tight groups. Confirming what other ProSport owners claim about these pellets. 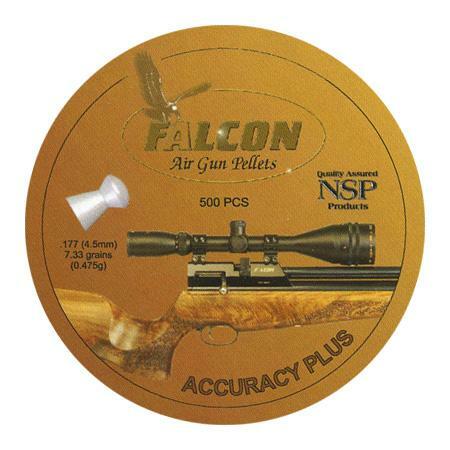 Use these in my FWB300s in Lea Valley's veteran series.Shooting very accurately out to 35yards at 7ft/lbs and generating wins.Also use them in my Falcon RN8 pistol in our pistol HFT series; good for a light pellet! Would not use them for FT or HFT as I consider they fall off over 35yds if non-ideal weather conditions occure.You really need the heavier 8.44,s to handle all the English weather throws at you.&nbsp;Would be good indoors, but pushing it outside at over 35 yards. I tried these in my BSA lightining SE they were bang on target every time. better than daystate and diabolo field and bisley magnum and smk black and baracuda and webley accu pell. Bought ten different test packs from pellet perfect and these came out on top, shooting was outside over two days, one still and one windy, target distance 25 yrds, both groups of eight shots covered by a 1 pence peice. I have just started using these in my Steyr LG110 Sport and Weihrauch HW 101 Carbine and have found them to be equally as good as JSB Exacts and Airarms Diablo Field which I have used constantly up until now. I shoot mainly FT and am pleased to have found another good quality pellet for outside use which are very accurate for my shooting needs up to about 55yds, even though they are considerably lighter. So far I have found no problem with damaged pellets in the tin. I used these in both an AA 510 and Daystate Mk4 and found them excellent and very consistent and accurate indeed. Hopeless on an outside range because of being so light but have never found a better pellet for target shooting indoors. Unlike Allan I have never had any obviously damaged ones in a tin and I can only imagine that made a big difference and / or they just didn't suit his barrel as AA Diablos don't suit either of my rifles!! Worth trying.